The green turboDial button is available on Opportunity records and Opportunity listings, making it easy to use turboDial as you are working through a list of Opportunities in Infusionsoft. 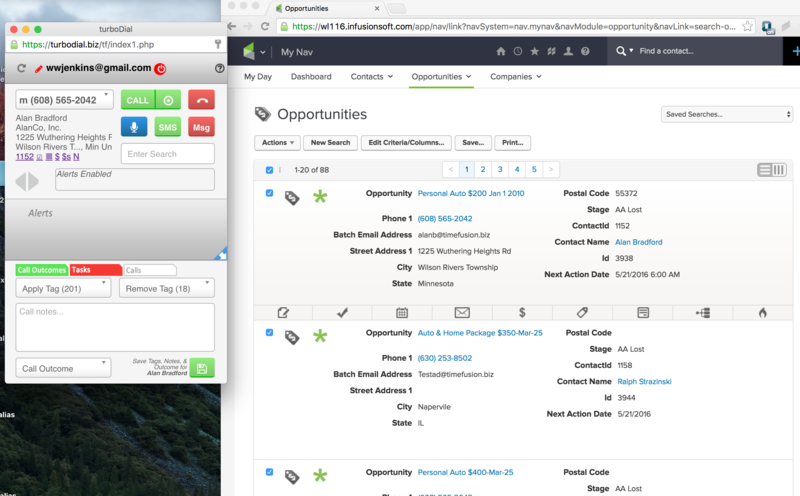 Any Opportunity fields you need access to as you are making calls can be configured to be visible in the interactive view of Opportunities in an Infusionsoft listing. See the image below showing turboDial being used side by side with an Opportunity listing. You can import a saved search of Opportunities directly into turboDial and navigate the list there. See the guide for List Dialing. You can use turboDial “Call Outcome Automation” to automatically move the Opportunity stage or move the next action date on Opportunities. However these 2 tools require there be only one Opportunity per contact.